Soufflés are typically high in fat and calories, but they don’t have to be! Especially not when you prepare them on your own using a few simple ingredients… only four to be exact! This dish is so light, simple and refreshing and it’s super easy to make! You can enjoy for dessert, breakfast, as a snack….any time of the day really. What’s even better is that any leftovers even taste great right out of the fridge. 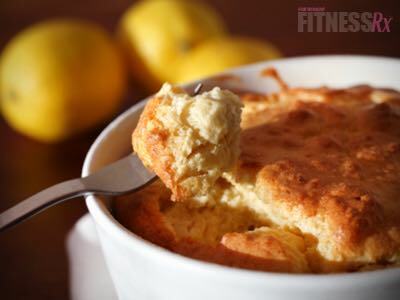 My Vanilla Lemon Soufflés will leave you deliciously satisfied without any of the guilt! 2. Coat 3 soufflé cups (you can use a muffin pan if you don’t have soufflé cups) with non-stick cooking spray. 3. Blend or whisk together egg whites, eggs, almond milk, and lemon juice until foamy. 4. Add in protein powder and blend well until fully mixed and frothy. 5. Fill each soufflé dish to the top, and smooth with a spatula. 6. Bake until soufflés rise, are firm in the center, and golden brown on top (approximately 20 minutes). As always…enjoy!